LUCKY LADY will show you a new dimension of being lucky, by playing with Extra Bet on Extra Reels. 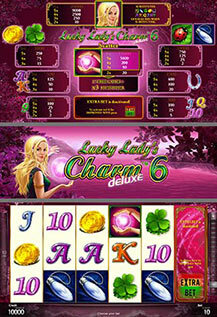 Explore the fantastic 10-line, 6-reel variation of the famous and favored video game ‘Lucky Lady’s Charm deluxe’. LUCKY LADY substitutes for all symbols except the scattered HAND SYMBOLS of the feature. The additional 6th reel can be activated by pressing the Extra Bet button. 3 or more scattered HAND SYMBOLS trigger 15 free games. Classic feature games’ wins are multiplied by 3, but feature games’ wins with activated Extra Bet are multiplied by 6. Feature games can be won again during Feature games and are played at current bet.